Babies with flat heads, otherwise known as flat head syndrome, typically have a flatness on either the back or side of their head. There are many types of flat head syndrome, with plagiocephaly and brachycephaly being the most common. As the bones in a baby’s head are still soft, it is possible for them to move and any flatness that occurs can be reversed to a certain extent. Babies with flat heads can develop this flatness due to a number of reasons. Over the years, the numbers of babies developing flat head syndrome have increased and as many as 1 in 25 babies are now affected. The advice that baby’s should be put on their back to sleep, to prevent Sudden Infant Death Syndrome (SIDs), is still incredibly important and should always be followed. However, placing babies on their backs at night and for extended periods of time during the day can be a causative factor of flat heads in babies and an unwanted side effect of this positioning. To prevent serious flattening of your baby’s head, follow this informative guide and find out the best ways to prevent and treat flat head syndrome. Something as simple as repositioning your baby can make the world of difference in preventing flat head syndrome. Babies with flat heads tend to spend a lot of time with pressure to the same part of their head. It’s important to know that, although babies should always be placed on their back to sleep, parents can still encourage their little one to turn to different parts of their head. For example, by changing the positioning of toys hanging above your baby’s cot, you can help influence which part of their head your baby will lie on. Additionally, alternating the orientation of your baby within their crib can have an impact in helping to prevent flat head syndrome. Make sure to take a look at our repositioning guide for more advice on how to prevent plagiocephaly with repositioning. Although putting a baby on their back is important for sleep, supervised tummy time gives your little one’s head a rest whilst encouraging the development of important muscles in their neck and shoulders. Read our tummy time guide for tips on how to make this fun for your baby, and make sure that you supervise them at all times. When researching how to prevent plagiocephaly in babies, a lot of parents might not realise the impact that simple changes can make. 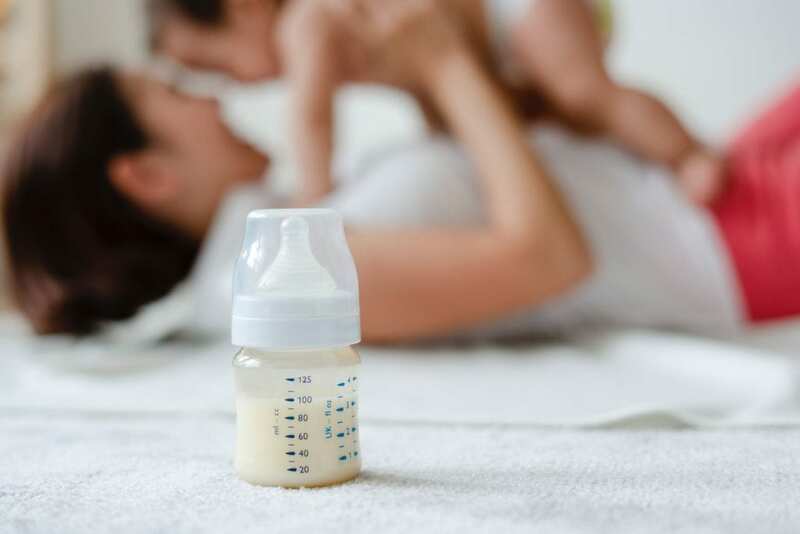 One of these changes is to alternate feeding positions, making sure that you aren’t holding your baby in the same arm during feeding, particularly when bottle feeding. This will prevent your little one from leaning against you on the same area of their head. You might already do this naturally, but this simple repositioning method is a great technique to help prevent babies developing flat heads. Ultimately, the more time that a baby spends lying on their back or in their car seat/carry cot, the more likely to are to develop a flattening on their head. To avoid this, we advise that you make a conscious effort to spend time holding your baby or using a sling (baby wearing) instead of having them constantly lying down. Additionally, take your little one out of their car seat as soon as a journey is over to remove the external pressure to their head. Car seat manufacturers recommend that a baby should not be in a seat for more than 2 hours without a break. For more information on the relationship between carry cots, car seats, and flat head syndrome, refer to our guide. Despite the prevention techniques available, flat head syndrome can still develop. For severe cases, further treatment can be required for babies with flat heads. If repositioning techniques have failed, our clinicians at Technology in Motion assess the severity of a baby’s flattening and decide whether a cranial helmet is required to correct it. However, this is only recommended once repositioning techniques have failed and the condition is considered severe yet treatable. Flat head helmets not only prevent flat head syndrome from getting worse, but correct the condition for babies with flat head syndrome. The helmet directs the natural growth of the baby’s head into what is a considered a more normal head shape. These helmets are an advanced cranial remoulding treatment and bring about the gentle correction of a head shape in a pain-free and effective manner. Our helmet, the TiMband, is custom-made for each baby and their head shape. Our years of expertise and experience have helped us to successfully treat hundreds of babies with flat head syndrome and our parent stories show you just some examples of how we have improved the lives of many infants. We hope that these techniques will help you understand how to prevent flat head and in most cases, repositioning and tummy time can be successful. For babies that do still develop a severe flattening and/or repositioning techniques haven’t worked, we recommend booking a free, no-obligation appointment at your nearest Technology in Motion clinic. Our clinicians will advise you on whether or not your little one would benefit from a cranial helmet. If you would like any additional advice or information, contact us and we will be happy to help you with any questions you may have.